Trans Mongolian Route Description. Stop along the way. Trans Mongolian railway, trans-mongolian, Moscow – Beijing. Siberian railway. The Trans-Mongolian Route: Moscow - Ulaanbaatar - Beijing. You will see Siberian plains and forests, Mongolian steppe and even a part of Gobi desert along this route that goes through Mongolia to China. 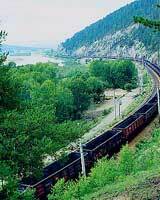 The Trans Mongolian Line was built from 1940 to 1956 between Ulan-Ude at Lake Baikal's eastern shore and the Chinese capital Beijing. From Ulan-Ude the tracks go south, towards Mongolia, crossing the large Gobi dessert and finally ending up in Beijing, China. This route has a length of 7867 km (Moscow - Beijing). One speciality you should see is the changing of the chassis at the Chinese border because of different width of the tracks in China and Russia. 3d 12h 20m Ulan-Ude, founded in 1666, is the capital of the Buryat Autonomous Republic, which in the 13th - 17th centuries was part of the vast Mongolian Empire. Overlooked by many travelers, this is a great place to stop for a few days (or even weeks - for Baikal). Ulan-Ude is the first place along the Trans-Siberian, where you feel like you're in Asia finally (after more than 2 days travel in the Asian part of Russia!). It has a feel of a calm, friendly Asian town (quite close to Mongolia, in fact), and there are a lot of interesting things to discover. Start with a local History Museum, visit a Buddhist Datsan, go to the open-air Ethnographic museum, and then go on to explore the Eastern shore of Baikal lake, which is much less tourist than the opposite Irkutsk side. In Ulan-Ude the Trans-Siberian splits into two directions: to the south through Gusinoye Ozero, Djida, Naushki (Russia) to Ulaanbaatar (Mongolia) to Beijing (China) - Trans-Mongolian, and to the east through Chita to Vladivostok (Trans-Siberian) and Chita to Manchuria (Trans-Manchurian). Gusinoe ozero (Goose lake) 5738 - 5766 km. The train goes along the western shore of Gusinoe Ozero (lots of geese used to live here). The town has a Buddhist temple (datsan) built in 1741 which is one of the main datsan in northern Mongolia (although the town is officially part of Russia). This is a picturesque area with valleys surrounded by mountains. The train travels along the Selenga River and makes a short stop in Selendum village. 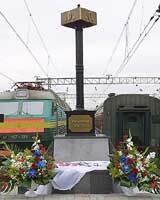 Naushki 5862 km This is a Russian border post where the train stops for 2 or more hours. The stop is from 1-3 hours depending on which train. Sukhbaatar 5751 km The town was built in 1940 on the banks of the Selenga and Orkhnon rivers. The town was named after the Mongolian military leader Suhbaatar. Nowadays it is the capital of the Selenge Province (aimak) with a total population of 20 thousand. This is the Mongolian side of the border; it can be a tough and rude procedure when crossing. All luggage is always carefully inspected solders. Please do not take any photos at this stop, if you are caught, your film and possibly camera will be confiscated. The stop is approximately 1,5 - 3 hours depending on the train. Darkhan 5874 km It takes about 8 hours to travel from Sukhbaatar to Darkhan (380 km). This is the second largest city in Mongolia with a population of 95,5 thousand. Darkhan is an urban city. The south part of Darkhan is quite picturesque. The stop is 30-50 minutes. Ulaanbaatar 4d 04h 55m. This is the capital of Mongolia which was founded in 1639 and was often moved along the Selenga river through Orhon and Tuul until it gained its present location. The city is strategically located on the great tea route between China, Russia and Europe. 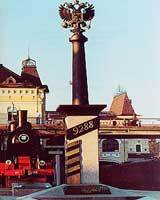 The train will stop for half an hour in Ulan-Bataar. The train station has many traders that can change money for you but using a bad exchange rate so watch out! Chojr The Chojr station looks like a cake and has a statue of VVT Ertvuntz, the first Mongolian cosmonaut. The town was an airbase during the Soviet period. Chojr is right in the middle of the Gobi Desert and has a population of approximately13 thousand. The train stop is 15 minutes. Dzamin Ude 6864 km This is the Mongolian border with China and is decorated with lights. Here you will have to show your customs declaration and immigration forms. The luggage of Chinese and Mongolia traders and foreign travelers is checked more carefully than others. The whole procedure takes 1-1,5 hours. Erlyan’ from Beijing 842 km It appears that Mongolia and China are in competition to see who will win a prize for the most annoying border service. At the station, the wheels of the train are changed to fit the Chinese tracks. If you will leave the train, please take warm clothes. The stop is approximately 4 hours. 415 km At this point, the train crosses the Great Wall of China for the first time. Daton 371 km This is a large industrial city with a population of over 2 million. The city is known as an industrial center and is home to numerous coal mines. One of the main attractions is a group of Buddhist cave temples – Yungang Grottoes. However, the stop is short - 8 minutes. 295-272 km At this point, the train travels along the Great Wall. The best view is around the 284 km mark. Beijing 0 km Beijing is the capital of China, one of the earliest centers of human civilization. This is the end of your journey or perhaps, just the beginning!